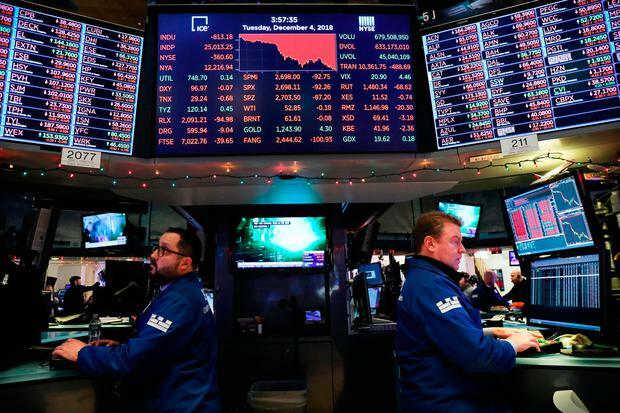 US stocks plunged in early trading yesterday, with the Dow Jones Industrial Average tumbling more than 600 points, as a litany of concerns wiped out the rally in risk assets. Trade-sensitive shares sank as angst mounted that the US and China made no meaningful progress on the trade front this weekend. Treasury Secretary Steven Mnuchin and President Donald Trump's top economic adviser, Larry Kudlow, dialled back expectations and added qualifiers when asked about the outcome of talks between President Donald Trump and Chinese President Xi Jinping. Adding to the risk aversion was news that UK Prime Minister Theresa May's push to avoid a hard Brexit may be at risk. "Yes, there is a halt in tariffs," said Delores Rubin, senior equities trader at Deutsche Bank Wealth Management. But "we haven't resolved anything yet". Dan Skelly, Morgan Stanley equity model portfolio solutions head, said that any breakthroughs on the trade issue bring the US Federal Reserve back into the spotlight. Fed Governor Jerome Powell said last week that US interest rates were close to their neutral level, implying there wouldn't be many more hikes. But that position could end up changing if a trade breakthrough provides a boost to the economy. "If you look at the market the last week or so you saw the market pop on both the dovish Fed - or a perceived dovish Fed, if you will - as well as the trade headlines. And it's hard to have both, in our opinion. And so these positive updates potentially on trade just bring the Fed back even faster," Mr Skelly said.